Hello, we are Rene and Julie Price. We're a friendly, tidy, semi retired, professional couple in our 60's, living in a lovely regency town in the Cotswolds. We've been married for nearly 40 years, own our own home and have our own car. We've no family ties, we love pets, gardening and generally pottering around. This year has been a bit of a mess! We were on holiday in Barbados during the Big Freeze and true to form, we had a leak in our house. Not ideal especially as we were due to sit for some friends in May. So, when we got back in late March, it was a fairly frenetic time getting insurance company organised (and a friend to deputise for us)so that we could go off down to the Pyrenees for a couple of months to look after 3 lovely dogs - a rescued small Pyrenean shepherd (Moet), a rather large hound (Leila) and a mixed breed which looked like a grey woolly sheep (Gizzy). They were such fun to be with and loved their walks round the country lanes. Moet was very clingy, she had been living with an English guy, who only visited her once a week or so - she followed us around everywhere and was just getting used to the rest of the pack when we were there. So insurance claim sorted, only took 6 months! and we sat for friends in Cheltenham, looking after a lovely black labrador, Pickle, her best pal a smooth haired dachshund, Branston and a rescued lab/retriever called Gemma, who is now blind and a bit deaf, but she still manages well and loves a good brush. In December, we're off to Spain to look after our favourite cats again. I think this is the 4th time we've sat for them while their owners, who are now good friends, go to the UK for Xmas and New Year. So that's 2018, below is how we started looking after pets and a bit about ourselves. A couple of years ago, we started planning a year off to travel around Europe and we decided to do a mixture of sight seeing and house sitting. We started our adventure on 1st of May 2016 and arrived back home on 3 July 2017. Rene generally ends up being pack leader if we are looking after dogs - except for meal times, then they change their allegiance to me! He's the first port of call for pets when they think it's walk or play time. He's very practical and is good with his hands. Until we left for our trip, he worked as a facilities manager for a large UK charity. He can fix most things and deal with most emergencies. He's opened and cleaned swimming pools for the start of the season and maintained the other pools we've come across. He's replaced a rotten step, cleaned patios and I think, loved mowing large gardens on the sit on garden mowers we've come across. Julie ensures any of our pets' special diets are adhered to, meal times are regular and administers any medication to the pets. Before our trip I worked for a large financial institution in the world of marketing to business customers. I can speak French (although a little rusty) and a little Spanish and German and I enjoy cooking and conversation. We both love gardening, so are happy to keep any outside space weed-free, tidy and wartered. If you are thinking about a house swap, let us know, we may be interested. During the 14 months we spent away from home, we pet sat for about 5 months, mostly through THS, but as well for friends and repeat sits for clients which never made it as far as the website. We're so glad we did, it was such fun and very rewarding, we met lovely people and pets along the way, some of whom have become friends, most of whom we are still in touch with. That's the great thing about house/pet sitting. You get to interact with different communities, travel to places which may not have been on your wish list but which you are pleasantly surprised when you get there, never get bored - how could you with the adorable/cheeky animals you are entrusted with! 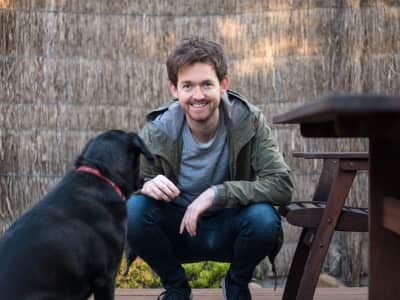 It's such a good idea - pets are in their own environment - no strange kennels, they keep their routine and their diet is adhered to - as well as the owners' properties being maintained and secure. Apart from the benefits to the homeowner, the benefits for the house sitter are also considerable - somewhere comfortable to stay in and look after, meet new people and pets and generally increase your knowledge of both the country and area as well as getting to understand our four (and sometimes two) legged friends a bit more. We enjoy the experience and the different communities and ways of life it's allowing us to come into contact with. It's an ideal combination for us - our love of travelling and pets - in fact of all animals. 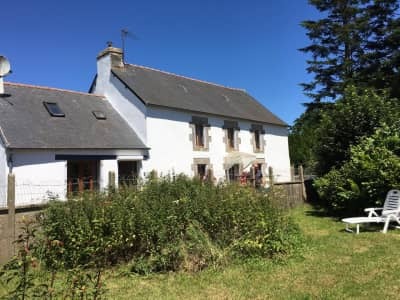 In May, 2016 our first house sit was in Brittany, looking after an elderly terrier on daily medication, as well as 2 cats - one of whom always came with us on our regular walks. From there we traveled through the vineyards around Bordeaux and sat for 3 beautiful and very entertaining cats and some fish in the centre of France. Then off to the Dordogne. We had 2 fabulous standard poodles to look after here - they were very good company and fun to be with. And there's the odd surprise. 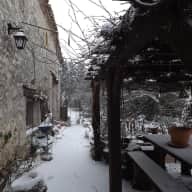 Our final house sit in France was near Poitier, where we had 2 elderly Westies on special diets, 3 cats and 6 chickens to look after. We arrived to find that the garden had been entered in the local village garden competition and the judges were due whilst we were sitting to view garden - nail biting times and lots of deadheading and weeding! However, the judges left saying it was the best one they had seen so far, so we awaited the verdict with nervous anticipation. Our endeavours paid off, resulting in another win for the Westies and their owners. We were very proud that we'd contributed, just a little. From Poitier, we headed into Portugal for 2 house sits. 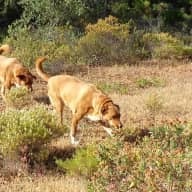 Our first sit was in rural Portugal looking after 4 large and lively dogs. 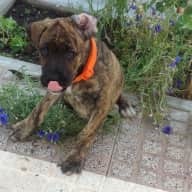 2 female Great Danes, weighing about 60 kilos each and 2 youngsters - a lively Boxer cross and a mischievous Labrador cross who'd just joined the family and loved digging holes. The second sit was in the Algarve where we looked after Bruno and Bella, big rescued local breed doggies and real softies. About 65k each who loved their walks through the countryside and were very well behaved. Arriving in Spain for the Autumn and winter, we house sat in 2 locations - both more than once. Our first sit was for 2 cats about 1/2 way down the east coast. Lovely animals, both very inquisitive. The owners were having a swimming pool built whilst we were there, the cats loved it - more places to explore and hide. We became firm friends with the owners and sat for them twice more over the next few months. 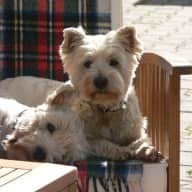 Over Xmas and the New Year, we sat for friends in the south of Spain looking after their large property and adorable Westie type dog whilst they went on a grand tour of Australia and New Zealand. After Spain, we caught the ferry to Italy and then on to Greece, exploring and visiting as many historical sites as we could. We've been back home since July 2017 and have been happily employed revamping our house and updating the garden. And now, we've time to pet sit again - carrying on where we left off. This year , friends have recommended us further afield. 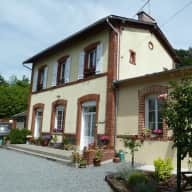 April/May 2018 saw us sitting in the French Pyrenees for an American couple who have dogs, cats, tortoises and a horse. In the Autumn, we sat for local friends whilst they went on a well earned break. Spring 2019 will be spent looking after 2 standard poodles for a Canadian couple on Vancouver Island whilst they take a grand tour of Europe visiting european relatives and their heritage. We feel very priviliged with our life and grateful that the home owners we've sat for have given us fabulous references and have asked us to sit again for them - we've enjoyed every minute. If, you'd like more information about us, please check our references or get in touch, perhaps via Skype or Facetime, we'd love to hear from you. Julie and Rene were our first sitters from Trusted Housesitters, and they were excellent. 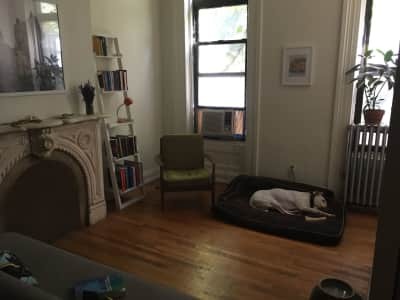 The dogs were so relaxed when we got home, the house all neat and tidy, and a delicious casserole in the fridge. They also collected us from the airport at midnight, which was so much appreciated. 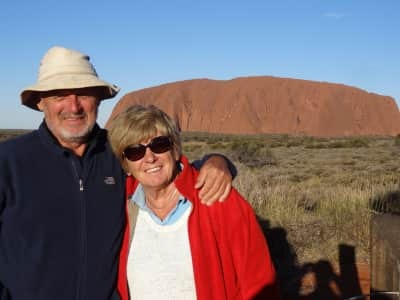 Thankyou Wendy, we did enjoy our time with B & B - it is a shame we cant do your next dates - but I'm sure you will have as good house sitters as us! Julie and Rene arrived promptly and proved to be a well travelled likeable couple. They got on well with our four dogs and looked after them all well. They also watered our numerous pots and borders for us. We were extremely pleased with the condition that they left our apartment. We are very grateful for their help. Weve known Rene and Julie for nearly 30 years. During that time, theyve helped out the family on many occasions, looking after our pets whilst we go on holiday. Most recently, this year, they looked after our 3 dogs, 2 of whom were poorly. Our elderly Labrador came out of hospital the day we went on holiday after having a knee replacement and needed careful monitoring and medicine to make sure she didnt overdo things and our blind dachshund had recently been diagnosed with cancer. We had no worries leaving our dogs; we knew they would be well looked after in fact they are looking forward to our next holiday! We have no hesitation in recommending them to look after your pets. Julie and Rene house and dog sat for us over Christmas and New Year. We have a large house, a lot of land, pot plants galore and two terriers both of whom loathe dried food. Julie sorted out their meals, Rene did the walks and when we got back the dogs hardly noticed us ! and everything had been taken care of perfectly. We have happily booked them again for later in the year.